But seriously though how do you look at that image and not get instant nightmares forever? To say I went into this movie with high expectations is a bit of an understatement. For months we've had insanely good trailers that left me craving more and an insanely high amount of positive reviews from not only critics but the legend that is Stephen King himself. And thankfully I can say that not only did the movie meet my expectations, but it pretty much shattered them in the process. Let's take a look and see why that is. The story follows a group of friends known affectionately as The Losers Club as they investigate the mysterious disappearances of many other kids in the community of Derry, Maine. After some supernatural experiences they begin to realise that they're dealing with a being that means only to bring fear and death into their lives. The Losers Club is made up of seven individuals which does seem like a lot but by the end I realised just how unique they all were and how they added to the story and characters in their own little ways. While all of them were terrific in their roles, the real standout was Richie, played by Finn Wolfhard who is most famous for his starring role as Mike in Stranger Things. He definitely brought the most laughs in the film and even brought the emotion when needed. This kid is definitely talented. I was surprised by just how funny this movie was as it was better than a lot of modern comedies by far. The main humour comes from the banter between the Losers Club and it's definitely great throughout. Normally this would bring down the effectiveness of a horror, but if anything it only increases the tension as you really begin to relate and care about the characters, so much so that you really don't want to see them get hurt or put in any danger. The danger doesn't only come from the supernatural force haunting the kids though, as the adults of the town can seem just as villainous. I don't think there was one adult here I found likeable as they ranged from severely overprotective to abusive to sexually creepy, all the way to a mix of all three. This was where the movie was gonna make or break. Could someone really honour the performance of an all time horror icon in Tim Curry's version of Pennywise? The answer is yes, and to be honest I prefer this iteration of Pennywise. 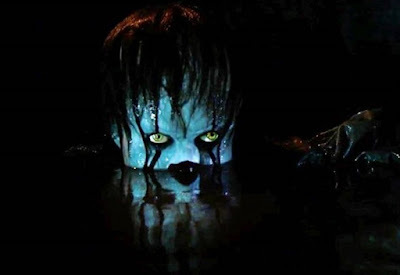 Don't get me wrong Curry's version was subtle and creepy, but there's just something about Bill Skarsgard's performance that crawls under my skin and stays there. 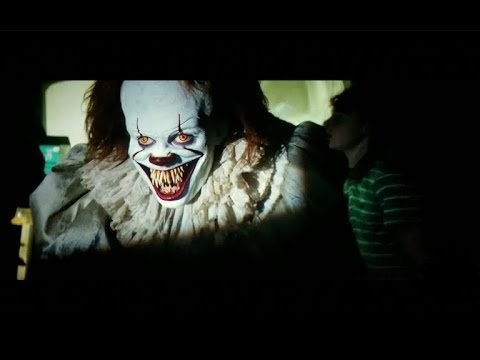 There's one scene in particular which you'll have seen in the trailer, where Pennywise takes over a projector to freak out our young heroes and believe me, those images will stay in my mind for a long time. The opening scene was a perfect introduction to the monster as it's the recreation of the classic scene featuring Georgie losing his paper boat down a sewer opening and coming face to face with Pennywise. I won't spoil what happens but it is surprisingly shocking and let's you know that Pennywise is not to be messed with. Again without spoiling, I did enjoy the finale as well as after two hours of buildup and suspense, it really does give you some satisfaction. Overall this was a fantastic movie worth going out of your way to see whether you're a fan of horror or not. It has everything I could want from a movie and then some. While a couple of scenes are out of place and there are some small flaws here and there, it isn't enough to derail the juggernaut that is IT. This might be my new favourite movie of the year. Funny, scary, heartfelt, and exceptionally entertaining, IT is a thrilling experience for all fans of film and it's worth checking out again and again. Come join us and we'll all float together.